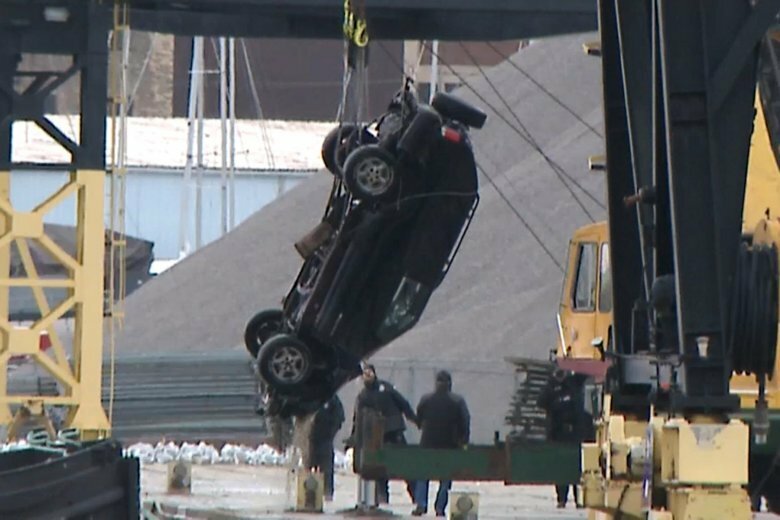 Surveillance video shows the vehicle speeding and the driver losing control Monday night before the SUV crashed into the Kinnickinnic River. It’s unclear who was driving the vehicle. The body of the toddler’s 19-year-old mother, Shannon Nehmer, was recovered from the water Monday but she was pronounced dead at the scene. Divers found the bodies of the 2-year-old girl, Annamelia Hernandez, and 29-year-old Charles Barefield on Tuesday afternoon after the SUV was removed from the water. Capt. William Beauchene, who oversees the department’s robbery division, said the vehicle was submerged in 30 feet of water and divers had to contend with low visibility. Autopsies were scheduled for Wednesday, according to the Milwaukee County Medical Examiner’s Office. Beauchene said the first robbery happened at about 7 p.m. Monday, when a man who was checking fluids under his car was approached by people who’d gotten out of a black Chevy Trailblazer. The man said they demanded money at gunpoint and he was struck in the face before one of the suspects took his phone and everyone left. Police said it’s probable the toddler was in the car during the robberies, but they don’t know for certain. Now, in addition to violent felonies, police can pursue vehicles that “present a clear and immediate threat to the safety of others,” according to the guidelines, as well as when a car is being used for drug dealing. “If not, they place their lives and the lives of others at risk,” she said.